This week was our last week before school starts. Because our summer has been so busy, I really wanted these last few days to be laid back and fun. As I write this, my son is conducting an experiment in my salad spinner, mixing shampoo with water and swirling it around. And he just informed me that adding a pen cap, a string, and a piece of plastic into the mix makes an extra-powerful tornado. I cleaned out my daughter’s room and moved her furniture around, too. And when she told me she wanted her bed at an angle almost in the middle of her room, I surprised myself and said… okay. It wasn’t the plan I had—her bed nice and tidy against the wall—but it’s cute. And she’s thrilled, which is what really matters. It’s been a fun and off-the-wall and messy week. I did things that I don’t normally do. The house needs to be cleaned. 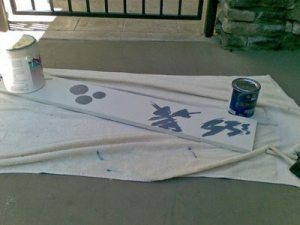 And to be honest, I’m burnt-out on paint brushes and glue guns and projects. The week was as good for this scheduled, planned, to-do list nut as it was for my kids. What a cool mom you are! I always have these grand intentions of pulling out all the art project stuff, but never really q u i t e make it!I’m looking to make the best of these last few days of summer too though. DH will take the boys to a car show tomorrow and then DS is hoping we can fit one more trip to the Train Museum in before Tuesday. Hey! That’s it! I’m not Arts and Crafts Mom, I’m “Field Trip Mom!” Thanks for helping me figure out my Mommydentity! How FUN!! !And, I understand and relate to the blow drying the hair again after a middle of the day swim!! Me too!!! Thanks for the tip on the LeapFrog quiz, I will definitely be checking that out! And happy end-of-summer to you, too! Let’s go swim with our socks on! I love catching the kids of guard. The enjoy it as much as I do. I also just relaxing this last week before school starts. Have a great weekend. And thanks for the Leap Frog tip. You are such a great mom! Isn’t it fun to surprise your kids and show them that you really do know how to have fun?! One thing I do sometimes to throw my kids for a loop is to have ice cream sundaes for dinner… yep, ice cream! They love it and I love seeing their faces light up:)I am totally with you on the hair drying thing. Sounds like a fantastic week! Salad spinner experiment: yes. Swimming with socks: gotcha. 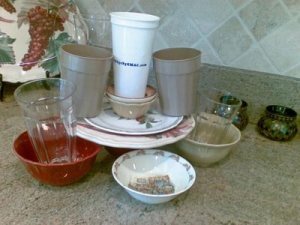 Stacking plates: I would pass out from holding my breath:) Isn’t it great when we can score another point in the great mom department?! You’re a cool mom now! It sounds like you all had a blast.Kids come up with the craziest stuff… swimming with your socks on? How did they come up with that one? Glad you all had fun. You have offically won the cool mom award!!! I am taking notes and so that I to do the salad spinner with Bella. Tell your son thank you for the fun tip! You are so much fun! LOL @ the tornado. I must say that is pretty clever!Sometimes the best times are when we are able to just go with the flow and let loose :) Sounds like you all had a lovely week. You are a good mom!! How fun!! What fun! I always let things slide during the last week or so of summer. What a fun week! Good for you! And just think of the great memories the kids will have. I’ll have to remember that. Love those pictures. A zany week now and then.. How terrific!My kids always want to swim in their underwear, maybe I should suggest socks:)! Sometimes I get so wrapped up in doing things the “right way” that I forget to let loose and have a little fun in the process. I want to be a cool mom like you! :) Thank you for a great reminder. I love this. I tried to do the same thing this week. Ice cream? Sure. Pizza Hut for lunch? Sure. The kids were shocked. I wanted to celebrate our summer together. Great post. Sounds like a blissfully chaotic week. Sometimes its wonderful to let the schedule go. Way to go mom! 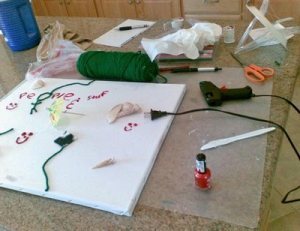 Your kids seem to be very creative, good for you for embracing it. Cracks me up that they wanted to swim with socks on.Am reading a book right now that talks about when our routines get too routine, we need to change them. Sounds like that’s what you did, and it reaped a huge benefit. What a great way to finish out the summer. *sigh*We are getting ready to start that last week of summer next week. Sounds like you and the kids had a great time… isn’t the unexpected great! Awesome post – I’ve rediscovered some PS2 games and surprised my kids when I took over the remotes and made them watch me as I took Scooby Doo through the crazy monster factory. Also, yes, I did the same jump in the pool thing too – they were so giddy. I have hair that gets curly-frizzy and don’t like the cold water – but it was so worth it to see them happy. Amazing how just saying “yes” to them sometimes can beat out any planned fun event you’ve set out to do. Sounds like fun! This post made me think of when my brothers and I use to make stew. We would put amything from the fridge in it. It was our own invention! Good for you to let things relax for a bit. My kids were just telling me yesterday that they really like the fact that once in a while the unimportant rules are deemed “optional”. What a fun week! We are trying to do as many fun, outdoor things lately also but for us it is also because it is going to get cold soon. YAY!!! What a great finale to a wonderful summer I’m sure….it’s so fun when we can chill and be kids with our kids sometimes….have an awesome weekend!! Yes – cool mom. Looks like yall had tons of fun!!! I love taht pool pic. This next week will be my last one before school starts … thanks for the inspiration! I love this! Just this morning I made a list of all of the fun things that we are going to do this coming week, because I wasn’t sure the kids had the greatest summer of their lives. I love the fun things you did with your kids, and I hope I can do something like this in the coming days, something that they’ll remember for a long time to come. I had to come back and tell you that: I did it Genny, I did it!When my granddaughter got here we went swimming AND…I did it. I not only did it once but 4 cannonballs!!! !Then a wonderful thing happened. My granddaughter, who only learned to swim last month, wanted to start jumping off the side. First to me with 2 hands, then to me with one hand and finally under the water. How much fun we had.After the swim we played chalk on the patio AND on her body (she just got so carried away with it). We always have fun together but today has been extra special.She’s resting now before dinner.Who knows, in Phoenix we can swim another month, maybe she’ll be diving by then.Thanks for doing cannonballs. Hats off to you! Salad spinners for entertainment… I must say I’m impressed with your laid back attitude. I don’t know if I could have allowed that, but those times your children will always remember. I’ll put these thoughts on a brain cell somewhere so the next time my son wants to do something crazy (every other day) I’ll try to say yes if at all possible. We’ll make a memory! Isn’t it nice when you can just be laid-back and say “yes” to the silly things your kids ask? One of the training drills that my kids have to do with their swim team is to swim laps with their socks AND sneakers on. I’d say they’re exhausted after that! Such a great reminder for this “to-do” list momma to relax and let the “hair get wet”! Hope the kids first week of school is fantastic! Yeah! I love this! Something about the end of summer gives us such freedom. I blogged last week about letting my children color their faces blue like Celts. Sounds like a great week. Those are the times your kids will remember. I have a hard time veering away from the schedule so this week I challenged myself too. I took my 4 year old to the fair and he had popcorn, cotton candy, and a huge lolipop for dinner. He was sooo happy!! !Too funny that they wanted to swim with their socks on..love it! Hope you had a great weekend!I wanted to let you know that I have an award for you and tagged you for a meme on my blog! What a great mom! Sounds like the perfect way to wind down summer. How fun to let your crazy side shine through. Sounds like your kids really enjoyed it too. I agree that tea is a great afternoon drink….although not in AZ in the summer. In the winter I am all about a cup of tea. Sounds like a wonderful week of memorymaking! Those planned-un-planned weeks can be tough on a house…and great on the childhood memories! What a fun post–and glad you got picks of the sock pool day!Blessings! Hey, Genni. I wanted to invite you to join us in “I See What You’re Saying,” the video meet and greet, on Sept. 30. Tomorrow I”m posting on how to upload your own video, in case people need that info. I hope you can join in the fun. Brings back great memories for me!! AND I understand about the hair thing!! !My kids used to daily have “water in the sandbox”. They took the hose out and made rivers and volcanoes (burying the hose and having the water run up and out the top). They would float their playmobile boats and people in the “rivers”. It kept them entertained for hours and gave me time for my own creations…loved those days! !God bless you as you get ready for school another year! Saw you over on MBC. I soooo appreciated your recent post. I had a few weeks of this on a vacation this summer. In contrast, today I sent my youngest son off to school–all day. I am in my 30s and feel like an empty nester. Anyway, your post made me think back on the great summer memories and realize I’ll have lots more opportunities to unplug and be present with them. Labor Day is only around the corner, right :)?